Suegen - Sutent geeft significant betere overall overleving en significant langere ziektevrije overleving bij GIST patienten die resistent zijn geworden voor Gleevec ( Imatinib). Dit blijkt uit een publicatie van een placebo gecontroleerde gerandomiseerde fase III trial die afgelopen maand is gepubliceerd. Zie hier de publicatie, daarodner de opzet van de trials zoals die in 2003 zijn gedaan met o.a. ook deelname van Nederlandse ziekenhuizen. 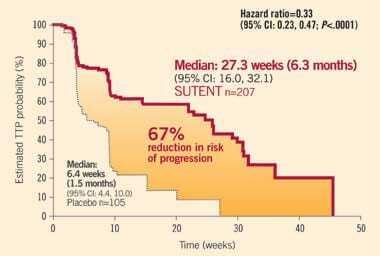 U kunt dus in Nederland terecht voor Sugen - Sutent. .
SUTENT demonstrated significant efficacy in a large phase 3 trial of imatinib-resistant gastrointestinal stromal tumor (GIST). * Starting dose was 50 mg once daily, 4 weeks on/2 weeks off. Dose reduction was allowed in 12.5-mg increments, to 25 mg/day. Patients received SUTENT or placebo and best supportive care. * Primary resistance=progression 6 months; secondary resistance=progression >6 months. Multicenter, double-blind, placebo-controlled study of 312 patients with imatinib-resistant or -intolerant GIST who were randomized to receive either SUTENT (50 mg once daily in cycles of 4 weeks on/2 weeks off) or placebo. 67% reduction in risk of progression. Women of childbearing potential should be advised of the potential hazard to the fetus and to avoid becoming pregnant. Given the potential for serious adverse reactions in nursing infants, a decision should be made whether to discontinue nursing or SUTENT. Left ventricular ejection fraction declines to below the lower limit of normal have occurred. Monitor patients for signs and symptoms of congestive heart failure (CHF) and, in the presence of clinical manifestations, discontinuation is recommended. Patients who presented with cardiac events, pulmonary embolism, or cerebrovascular events within the previous 12 months were excluded from clinical studies. SUTENT has been shown to prolong QT interval in a dose-dependent manner, which may lead to an increased risk for ventricular arrhythmias including Torsade de Pointes, which has been seen in <0.1% of patients. Monitoring with on-treatment electrocardiograms and electrolytes should be considered. Hypertension may occur. Monitor blood pressure and treat as needed. There have been rare (<1%) reports of subjects with seizures and radiological evidence of reversible posterior leukoencephalopathy syndrome (RPLS). None resulted in a fatal outcome. Hemorrhagic events including tumor-related hemorrhage have occurred. Perform serial complete blood counts (CBCs) and physical examinations. In an ongoing clinical trial of patients with metastatic non–small cell lung cancer (NSCLC), fatal pulmonary hemorrhage occurred in 2 patients, both with squamous cell histology. SUTENT is not approved for use in patients with NSCLC. Hypothyroidism may occur. Monitor thyroid function in patients with signs and symptoms of hypothyroidism and treat per standard medical practice. Adrenal hemorrhage was observed in animal studies. Monitor adrenal function in case of stress such as surgery, trauma, or severe infection. CBCs and serum chemistries should be performed at the beginning of each treatment cycle. Dose adjustments are recommended when administered with CYP3A4 inhibitors or inducers. The most common adverse reactions (ARs) occurring in ≥20% of patients receiving SUTENT for treatment-naïve metastatic RCC (all grades, vs IFNα) were fatigue (58% vs 55%), diarrhea (58% vs 20%), nausea (49% vs 38%), altered taste (44% vs 14%), mucositis/stomatitis (43% vs 4%), anorexia (38% vs 40%), bleeding, all sites (30% vs 8%), hypertension (30% vs 4%), vomiting (28% vs 14%), dyspepsia (28% vs 4%), rash (27% vs 11%), abdominal pain (22% vs 12%), asthenia (21% vs 24%), and hand-foot syndrome (21% vs 1%). The most common grade 3/4 ARs (occurring in ≥5% of SUTENT patients) were hypertension (10% vs <1%), fatigue (9% vs 14%), asthenia (7% vs 6%), diarrhea (6% vs 0%), and hand-foot syndrome (5% vs 0%). The most common grade 3/4 lab abnormalities occurring in ≥8% of patients with treatment-naïve metastatic RCC receiving SUTENT (vs IFNα) included lipase (16% vs 6%), uric acid (12% vs 8%), neutrophils (12% vs 7%), lymphocytes (12% vs 22%), and platelets (8% vs 0%). The most common ARs occurring in ≥20% of patients with GIST and more commonly with SUTENT than placebo (all grades, vs placebo) were diarrhea (40% vs 27%), anorexia (33% vs 29%), skin discoloration (30% vs 23%), mucositis/stomatitis (29% vs 18%), asthenia (22% vs 11%), altered taste (21% vs 12%), and constipation (20% vs 14%). The most common grade 3/4 ARs (occurring in ≥4% of SUTENT patients) were asthenia (5% vs 3%), hand-foot syndrome (4% vs 3%), diarrhea (4% vs 0%), and hypertension (4% vs 0%). The most common grade 3/4 lab abnormalities occurring in ≥5% of patients with GIST receiving SUTENT (vs placebo) included lipase (10% vs 7%), neutrophils (10% vs 0%), amylase (5% vs 3%), and platelets (5% vs 0%). Lees verder op deze internationale website voor GIST-patiënten hoe u zich aan kunt melden en beschrijving van trialdoelen. June 4, 2003 New compound shows promise when Gleevec loses potency in patients with rare digestive-tract cancer Jonathan Fletcher, MD, confers with George Demetri, MD. Patients with the rare digestive-tract cancer known as gastrointestinal stromal tumor (GIST) who develop resistance to the front-line drug Gleevec may benefit from a novel compound that targets specific genetic mutations in GIST cells. At the American Society of Clinical Oncology’s annual meeting in Chicago, scientists from Dana-Farber Cancer Institute presented data from an early stage clinical trial of a new drug called SU11248 in patients with Gleevec-resistant GIST. The study, headed by George Demetri, MD, demonstrated that 11 of the 18 patients (61 percent) with progressive metastatic GIST experienced disease shrinkage or stabilization with no further progression when treated with SU11248. Like Gleevec, SU11248 target specific enzyme switches, called kinases, that keep cancer cells growing. The findings were presented June 1. An estimated 5,000-10,000 cases of GIST are diagnosed in the United States each year. Surgery has been effective in treating some patients when the disease has not spread, but there are few treatment options for those patients in whom the tumor spread beyond the original site of surgery. Last year, the FDA approved the use of Gleevec as the first effective treatment for GIST. Gleevec has proven to be highly beneficial therapy for metastatic GIST, but not all patients can tolerate it and some develop resistance to the drug over time. "Approximately 85 percent of GIST patients benefit from treatment with Gleevec, but, over time, they tend to develop resistance to it and the disease once again begins to grow," says Demetri. "Two-and-a-half years after starting treatment with Gleevec, approximately three-quarters of patients will show some level of resistance to Gleevec. There is no other effective treatment for these patients, and that is why we need new treatment options for them." Last year, Demetri and his colleagues, including Jonathan Fletcher, MD, of Dana-Farber and Michael Heinrich, MD, of Oregon Health and Science University, sought to identify what those additional mutations are and to design a counterattack with a new targeting strategy. They screened a variety of compounds known to act against abnormal enzymes. The results with SU11248, which is now made by Pfizer Oncology of La Jolla, CA, were particularly promising. "SU11248 is a small molecule that inhibits the production of four enzyme switches: KIT, PDGF-R, VEGF-R, and FLT-3," explains Demetri, who is also an associate professor of medicine at Harvard Medical School. "Laboratory and animal studies showed it could be effective in GIST cells that had become resistant to Gleevec. The VEGF-R blockage is particularly interesting, too, since this drug is a powerful anti-angiogenesis drug, blocking the growth of new blood vessels to feed tumors, as well as shutting down other overactive enzyme switches inside the cancer cells." Based on the results of those pre-clinical studies, Demetri and his colleagues began a Phase I clinical trial of SU11248 in patients with Gleevec-resistant GIST. (The main purpose of a Phase I trial is to determine the safe dose for administration of new medications.) Successive groups of patients were treated with SU11248 at starting daily doses of 25, 50, or 75 mg. for 14 days, followed by a 14-day rest period per cycle. The maximum safe dose was determined to be 50 mg. after some patients at the 75-mg. dose level experienced unpleasant, but temporary, side effects (fatigue, nausea and vomiting). The development of SU11248 as a potential treatment for Gleevec-resistant GIST "is an exciting example of the new world of targeted therapy," Demetri remarks. "We can analyze cancer cells to identify mutations, then screen drugs in the laboratory that target those specific mutations. The resulting therapies should be more effective and less toxic than traditional chemotherapy, which tends to attack normal cells as well as cancerous ones." In addition to Fletcher and Heinrich, the study’s other contributor were Annick Van den Abbeele, MD, of Dana-Farber, Christopher Fletcher, MD, of Brigham and Women’s Hospital, and collaborators at Pfizer Oncology (formerly the biotechnology company known as Sugen). Dana-Farber Cancer Institute is a principal teaching affiliate of Harvard Medical School and is among the leading cancer research and care centers in the United States. It is a founding member of the Dana-Farber/Harvard Cancer Center, which has been designated a comprehensive cancer center by the National Cancer Institute. Reageer op "Sugen - Sutent geeft voor GIST-patiënten die resistent voor Gleevec - Imatinib) zijn geworden, significant betere overall overleving en significant langere ziektevrije tijd aldus publicatie van fase III trial met Nederlandse deelname."